Discuss and reflect on their current lives, cope with prison life, mourn losses and regrets, and celebrate successes. Each new class participant receives an NVC textbook for the course, free of charge. The concept of Restorative Justice is foundational to NVC consciousness. Compassionate communication, self awareness and other tools can be used to empathize with people who have received harm, including the community at large—even without directly facilitating real-time dialog between the one who did harm and the one who received harm. NVC facilitates understanding of how the person who created the harm was attempting to meet their universal human needs however unskillfully, and often tragically and violently. As BayNVC’s social justice project, Safer Communities’ vision is to transform the California State judicial system from a punitive justice system to a restorative model, one NVC class at a time. 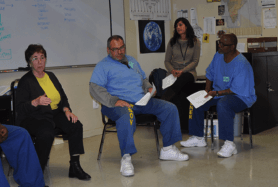 Please consider contributing today to ensure that the Safer Communities Project can continue to make nonviolent communication classes accessible to the hundreds of motivated and eager students in San Quentin State Prison and beyond. Safer Communities is primarily a volunteer-driven project. If you would like to find out more about how you can get involved by teaching, fundraising, writing grants, etc., please contact Meganwind Eoyang at meganwind@baynvc.org. A team of highly skilled, dedicated volunteers makes the Safer Communities Project possible. Many on our team have studied with Marshall Rosenberg and BayNVC’s founders. While others are graduates of BayNVC’s Leadership and Immersion Programs or John Kinyon’s Mediate Your Life, A Training Company. Currently, there are 14 active volunteers teaching in the prison and jail and supporting the project administratively. Former team members have gone on to build nonviolent communication prison programs in a number of other states, and New Zealand.